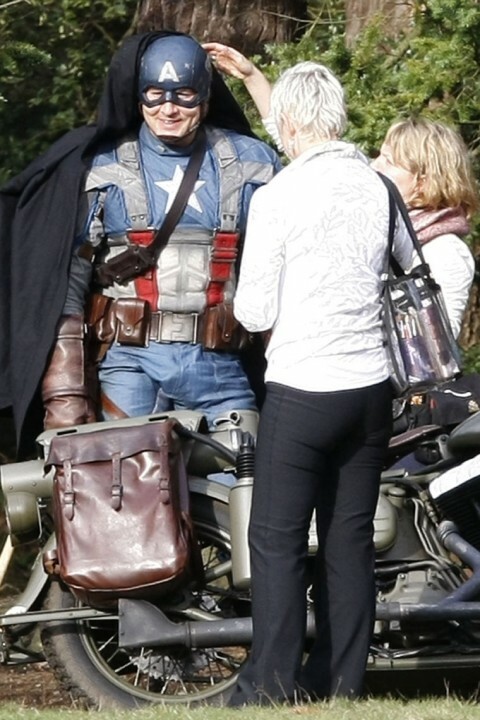 Courtesy of buddy John, a fan has uploaded behind-the-scenes photos of a stunt shoot from the upcoming Captain America movie showing some costuming details. Enjoy! Jeff, You’ve got to add those boots! Or at least add the buckled tops so they can be added to existing boots. Yesss. Add Cap’s boots! Uh, please. And I’m diggin’ the helmet head. Just like the one shots from the 70’s. I mean, Captain America wouldn’t advise kids to do something he wouldn’t, like ride motorcycles or go to war without wearing a helmet. Looks like Chris Evans has got a little doughy for the role 🙂 Love the costumes look and I dig the Hydra bikes and steampunk car, also great to see the wings on the old helmet. With this being a period movie by the guy that directed The Rocketeer I can’t wait. Is…Is he wearing a musclesuit? You have to remember, this is just a stunt double, seen in cutaway and long-distance or short-duration shots, he’s not the actor playing the actual part. The overall costume is not bad, alot of his costume redesigns are not bad, but for someone other than Steve Rogers. The original (yes with wings), after a bit of fine tuning always has been, and always will be the best. I sure it’ll look better with cam filters on. It looks not bad, but I suspect he’ll get a more modern costume if they go for the whole frozen/unfrozen in the 21st century deal. Is it me, or is the stunt double in the pictures corpse white? I thought this was supposed to be for Captain America: the First Avenger. This guy looks more like Captain America: First Zombie Hero.